Angry Koala Gear: GUARDIANS OF THE GALAXY & X-MEN: THE BLACK VORTEX! 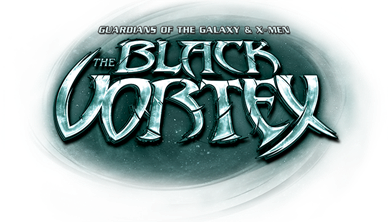 GUARDIANS OF THE GALAXY & X-MEN: THE BLACK VORTEX! The Guardians of the Galaxy, the All-New X-Men, Nova, Captain Marvel, Cyclops and more team up for a cosmic throwdown the likes of which have never been seen in GUARDIANS OF THE GALAXY & X-MEN: THE BLACK VORTEX! On sale this week, the highly anticipated first issue in the upcoming crossover from fan-favorite writer Sam Humphries and blockbuster artist Ed McGuinness! The Black Vortex, an ancient artifact of immense and immeasurable power has resurfaced on the far side of the galaxy. With the power to unlock its users true cosmic potential, in the wrong hands, the Black Vortex’s power could be a force of unparalleled destruction. Imagine the power that transformed Jean Grey into the Phoenix or Norin Radd into the Silver Surfer available to anyone, and in the hands of those who would use it for evil! Kicking off in this special Alpha issue and continuing through some of your favorite Marvel titles including Guardians of the Galaxy, Legendary Star-Lord, All-New X-Men, Captain Marvel, Nova, Cyclops and more, be there for the beginning of the next great out-of-this-world crossover when GUARDIANS OF THE GALAXY & X-MEN: THE BLACK VORTEX ALPHA #1 hits comic shops and digital devices this February!